Fair warning: Even though I suggest these as options for after FOX’s Almost Human, most of them actually came out before this series aired. As a poster on i09’s site recently pointed out, the intriguing style of the show may actually be as much sci-fi tribute to the 1980’s classics as it is something new. But while its content is sometimes of debatable quality, and it hasn’t blown my mind yet, the show does have something undeniably attractive about it. District of bars and “recollectionists” in The City of Almost Human. It’s a mix of elements that keeps me coming back every Monday. First, Almost Human seems to be doing a pretty nice job so far of balancing characters and plot, although I feel the secondary characters need a bit more characterization at this point. Meanwhile, the show’s city, part Neo-Tokyo, part Neo-Vancouver, is a superbly realized environment, and the CSI technology (which is so much a part of the show’s aesthetic) is designed well enough to be cool but remains seemingly functional. Also, the pieces of info they are currently throwing us about the mysterious Wall and Kennex’s new attempts at remembering the attack by Insyndicate point to the fact that they are definitely building toward something. But that something might be the season finale. Pull out your DVD/digital copy of Blade Runner (1982) and give it a second, fourth, fifteenth watch. Not only does it hold up pretty well, but you’ll see how much the Almost Human team has directly alluded to it. For instance, when I saw the geisha advertising sign in the tenth episode of AH my jaw dropped a little at how unsubtle they were getting. Blade Runner boasts significantly fewer robots and a lot more 80’s make-up than FOX’s series, but the casual, callous way in which the Replicants are treated and the no-nonsense, grouchy detective protagonist will feel familiar nonetheless. 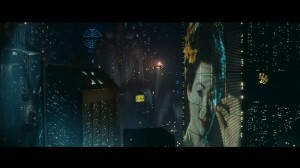 The original geisha billboard from Blade Runner. If you want more actual androids, then perhaps you should watch Spielberg’s 2001 A.I. Artificial Intelligence. The many humanoid machines it features work in occupations that span much more than law enforcement. And I think that Dorian would appreciate the examination of sympathetic android David’s predicament in a human-focused world. In many ways this epic is more science-fairytale than science-fiction, but with that in mind many of its scenes still ring true. Many of you have probably seen Gattaca (1997) already, but the latest episode of AH with its Chromes reminded me of this great film. The style of this movie is also not far from that of Almost Human, and it succeeds in being a true sci-fi story while remaining focused on its characters and their internal struggles. If you haven’t watched Fringe (2008-2013), and you’re fine with some crazy stuff, you might want to give that a shot. Before he created Almost Human, J.H. Wyman worked on the second season of Fringe, which is the closest thing we have to a modern X-Files. This will hopefully take care of your mystery cravings and desire for cases that consist of a bit more than just another bank robbery. If you really dig Kennex and Dorian’s bickering and banter, and like mysteries no matter the level of science content, consider stepping outside the sci-fi genre to watch CBS’s Elementary (2013-current). The NYC-based show is billed as a new twist on Sherlock Holmes and Dr. Watson, but it’s really come into its own as a series that is pushing the envelope in quality character building. You don’t need to be a fan of the old Holmes to find the new one, played by Jonny Lee Miller, acerbically charming, and I’m pretty sure Joan Watson (Lucy Liu) is 80% cooler than the rest of the Watsons combined. If you really want to stick to something closer in style and genre to Almost Human, but are willing to switch media, try something like Ghost in the Shell or Psycho-Pass. The former is a Japanese anime classic, with multiple series and films to choose from. It features cops that have been augmented in varying degrees with cyber pieces. There’s plenty of explicit and implicit dialogue on the essence of humanity and our ever more intimate involvement with our technology. Ghost in the Shell: Stand Alone Complex (2002-2003) is probably an okay place to start, but many fans will tell you to go back to the 1995 film to do it right. 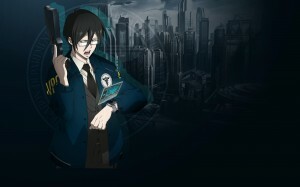 Psycho-Pass (2012) is just a single intense season of animation. 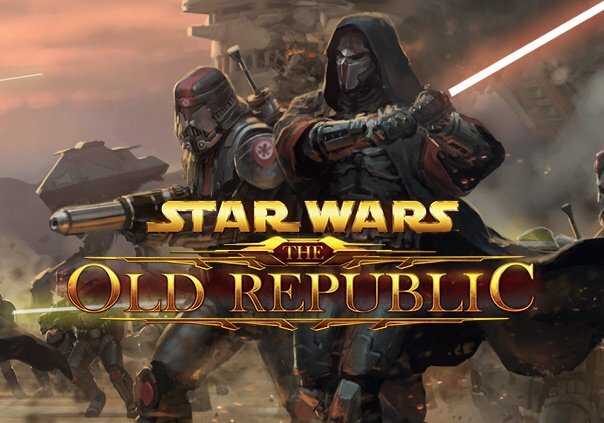 The officers of the Public Safety Bureau, who work alongside latent criminals, are charged with protecting the city according to the wisdom of the powerful AI known as the Sibyl System. Some pretty slick technology plays a huge part in both the type of horrible crimes they encounter and the way the Public Safety Bureau solves them. It also has the dubious honor of being one of the most violent anime I’ve ever seen (the PSB’s “Dominator” guns can literally blow people apart). 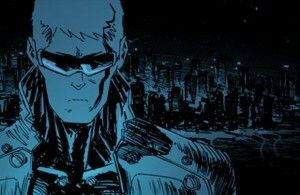 Solano, the protagonist of Old City Blues, drawn by Milonogiannis. I recently read the brilliantly drawn first volume of a series entitled Old City Blues (Archaia Press 2011) by Giannis Milonogiannis. Not only is the story set in 2048 (the same year as AH) but the New Athens police force seems like it would get along pretty well with Captain Maldonado’s department. Anyone who has read Katsuhiro Otomo’s manga masterpiece Akira will love the dynamic, line-based panels reminiscent of scenes in Neo-Tokyo, and anyone who likes tough cops and ninja-like robots will find something to enjoy as well. The first volume is good, and introduces us to all the major players and villains (probably), but seems to be setting up for something bigger to come in volume two and thus doesn’t wrap up everything perfectly. Still worth a peek if you like graphic novels. 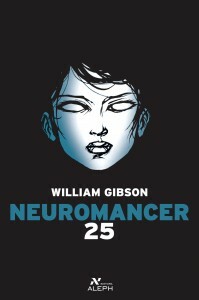 Cover of Neuromancer depicting character Molly Millions. If you want to get some serious reading done, I recommend looking up William Gibson. Coming off of my stint watching AH, Gibson’s Neuromancer (1984) seems as logical a choice as any, but Idoru (1996) might also be a good bet. Gibson’s work is very solidly cyberpunk, but he tends to focus on formless, net-dwelling AI as much or more than on physical android-human interaction. There are plenty of tech-augmented humans in his stories though, and his writing always keeps one’s brain working as he throws the reader into his complex, often messy view of the future. If you know of any other great cyberpunk movies/TV series/books that aren’t listed here, please share!